Read ‘In the American East’ by Richard Bolton and write a reflective commentary on its relevance to documentary practice. In ‘In the American East: Richard Avedon Incorporated’, Bolton makes a damning indictment of Richard Avedon‘s project ‘In the American West’, which he uses as an example of the current state of the art world, the wider U.S. economy and how this relates to the power divide between the classes. For Bolton, ‘In the American West’ is also a cautionary tale about the risks that wildly successful ‘blockbuster’ exhibitions pose to the art world – the critical institutions of galleries could become mere leisure amenities working to the demands of corporate business. consistent look and repetition is reminiscent of police photographs which means his subjects automatically exude guilt. This leads the viewer to construct stereotypes and see the subjects as ‘other’ rather than as people. Avedon’s assertion that his work is fiction does not alleviate social responsibility and he ducks the opportunity to explore real social conditions and the realities of power. Bolton quotes Barthes’ argument that photographs are polysemic in meaning depending on their context and use, however, rather than seeing this as a defence of Avedon’s work, he states that although context can make certain readings possible it can also make other readings impossible. The links between ‘In the American West’ and two art institutions The Amon Centre, who commissioned the work and the Boston’s Institute of contemporary Art, who exhibited the work are explored by Bolton. The relationship with the Amon centre are presented in quite straight forward ways – having financed the five-year project they inevitably had a great deal invested in the project’s success. It is understandable then that they would want to control how the project was projected and maximise media attention in order to ensure the work was a success, however, Bolton laments that this should be at the expense of critical analysis and that the show became a media and public relations spectacle. Inevitably this marketing strategy also leads to the commodification of the work, and most importantly, the success of the strategy meant the strategy became a blueprint for further exhibitions. Studying the projects exhibition at the ICA, Bolton is forensic and detailed in his presentation of the argument he has put forward about the danger of entwining art and capitalism. The exhibition was sponsored by Filene’s, a fashionable Boston department store who paid for everything associated with putting on the show except for the installation of the photographs themselves. This sponsorship extended to the store itself with some of Avedon’s images being used to promote Western wear – the unfashionable juxtaposed with current trends. The use of ‘Sandra Bennett, 12 years old’ (1980) in the promotional material is a case in point – Bolton argues that the image recurs so frequently it becomes a kind of logo. The image is one of the least confrontational of the image which avoids rupturing the carefully constructed media image through the creation of embarrassing juxtapositions and therefore avoids the moral issue of profiting from the dispossessed. The repetition of the image also leads to audience familiarity meaning they are less likely to examine the specific context of the images. Bolton also believes the image is particularly appropriate for Filene’s as Sarah Bennett represents the store’s target market while delivering the message that they have the power to transform the unfashionable. the surface that is presented. He also believes Avedon is exploiting the subjects in the same way that capitalism does, indeed, he sees him as exactly the same – someone from a privileged exploiting the bleak reality of a group of lower class people for his own gain. Bolton quotes Adam Gopnik, an advocate of Avedon, who argues that the pictures should be understood as archetypes which are about fundamental truths of human experience rather than specifics. Bolton agrees with this assessment but also believes this proves what is wrong with the work rather than justifying Avedon’s approach as showing fundamental truths, the photographs are concerned only how things look and superficial resemblances: “We are left with photographs that cannot provide understanding but that still offer a voyeuristic charge.” Rather than concentrating the viewer on the similarities in each portrait through the formal style he uses: “a look that is direct, uncomfortable, awkward and grim.” Avedon shows how his subjects are united through alienation. Through his control, Avedon presents his subjects like actors and he constructs stereotypes which disavow human experience as style rather than social reality. Most disturbingly, if we agree with the depiction of Avedon’s subjects is a true representation then we must also agree that marginalisation is an unavoidable part of the human condition. 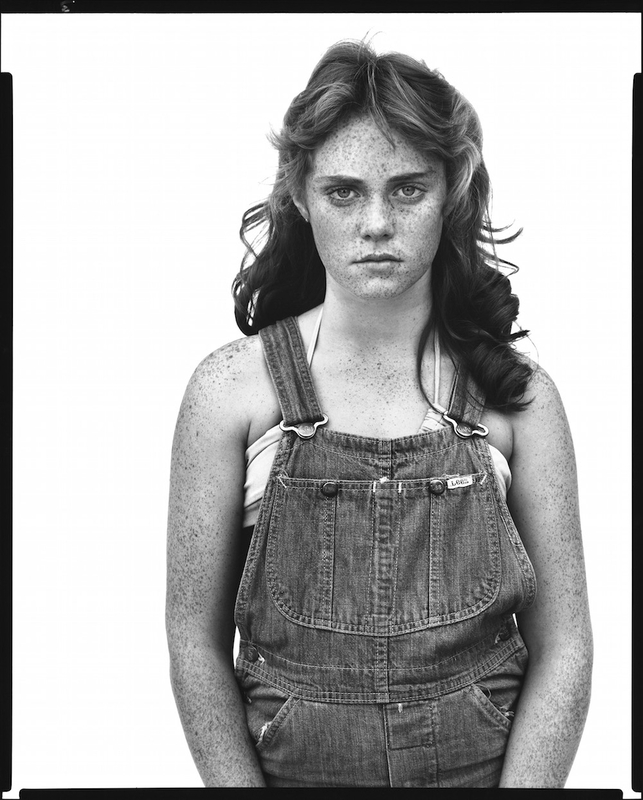 Bolton acknowledges that the subjects Avedon photographed are apparently happy to be part of the work but believes this does not mean they are not exploited by the art system: a powerful class that also controls the production of history and culture and puts more value on their image than their lives – they are employed as little more than signs of the dispossessed. The myth of artistic genius and authorship is also consciously used by Avedon along with art references that legitimise the images as works of art and culture in order to distance them from their direct relationship with the social crises and conditions the subjects are part of. Rather than doing this however, Bolton argues this is yet another example of appropriation by the ruling classes. I am sympathetic to Bolton’s arguments and find his essay passionate, detailed and well argued, and yet, I am left unconvinced. The suggestion in the paper is that the rise of the blockbuster exhibition is something that is new, dangerous and increasing the divide in power relationships in the art world. For me, this is more of an evolution of the realities of artistic patronage as well as being a pragmatic way that work can be made. Art history is full of work that it could be argued are exploitative and I am not sure Avedon is any more or less than others that have gone before him. Indeed, it could be argued that he is ‘paying’ his subjects thousands of dollars by giving each of them a print – something Bolton acknowledges sell for $14 000 each. If we compare this to how Florence Thompson, subject of Dorothea Lange’s ‘Migrant Mother’, perhaps the most famous example of social documentary photography, did not even receive recognition of her name despite being the subject of one of the most reproduced photographs ever, then I would argue Avedon is much less exploitative. have been raised about why he is treating these subjects differently. That said, I agree that the removal of context means we are forced to evaluate each image/subject based solely on how they look and what they are wearing – for me, this is also a powerful way to concentrate attention on the human nature of portraiture. Understanding any photograph of someone else is a process of being able to identify with ways they are similar and different to us, by photographing against a plain background Avedon produces direct and affecting images, I doubt very much that if these were environmental portraits the concerns Bolton raises would be satisfied – if anything charges of exploitation could be more vigorously argued. For me, Charlotte Oestervang‘s Appalachia series is evidence that providing context for portraits does not necessarily support a more empathetic response. By showing the people she photographs in their surroundings Oestervang provides a more thorough picture of poverty and marginalisation than Avedon, I wonder how accurate a portrayal of these people she is presenting – it is a leap of faith to believe that what we are shown is accurate and fair, to my eye the pictures appear to focus on extremes. While some of the images show movement, which suggests they could have been taken in a candid style, most are posed which suggests Oestervang has directed her subjects and makes me question why she has chosen to focus on these particular people. It would be pure speculation to try and ascertain whether this is a true representation of the Appalachian community, like Avedon, she has chosen to provide no further context as she wishes to “invite viewers to make up their own mind.” Some parts of the brief accompanying text for the images are troubling: Oestervang only stayed in the region for two weeks which is a very short amount of time to make a considered body of work, her intent was to produce single images that would stand alone which suggests a preference for the dramatic and extreme rather than a more rounded representation, and, she was totally unfamiliar with the area and culture meaning the resulting images can only focus on the ‘other’ – there is no evidence that she attempted to understand the people and the area in any more than a superficial way.